This was my first custom made quilt. I want to document this for myself and also if you've ever thought about making a quilt for someone it can show you what I went through. I've made other custom items and done a good amount of alterations and repairs for people so I wasn't worried about working with someone. I am confident in my quilting and sewing abilities and wasn't worried about taking on something like this. I can say there were a few times in the past that I probably shouldn't have taken something on. Those are better left in the past. A neighbor came to me and asked if I was interested in making a quilt for a good friend of hers from Germany that was getting married. I don't beat around the bush any more or agree to do something that I give away my time. It's only taken me my lifetime to learn that. Like I said I had never made a custom/comissioned quilt so I really didn't know what to charge. But I figured I would set a reasonable hourly rate and charge how long it took me. Her requests were that she wanted patchwork but something cohesive with a bit of a pattern and more traditional. Oh, and it needed to be 108" x 108". I'm chuckling because if you are a quilter you might realize just how big that is...a good king size quilt for sure! In order to have an idea of how long it was going to take I accounted for my time and made a very simple patchwork quilt top that was probably a 10th of what she wanted and then multiplied it out. I gave her a range of what it could be and added in a little extra for unexpected. I kept my confidence even though it was the most I've ever charged on any one item. Quilts are so worth it in my opinion because I know what goes into them. However someone who has no clue is probably thinking I can get a quilt from Target for $49! Why would I pay hundreds of dollars for one? Anyways, she did not balk at the quote and agreed to it. Now on to the design. My problem I quickly realized, is deciding on a pattern and then figuring out just how much of each fabric I would need. That in itself would take a significant amount of time. 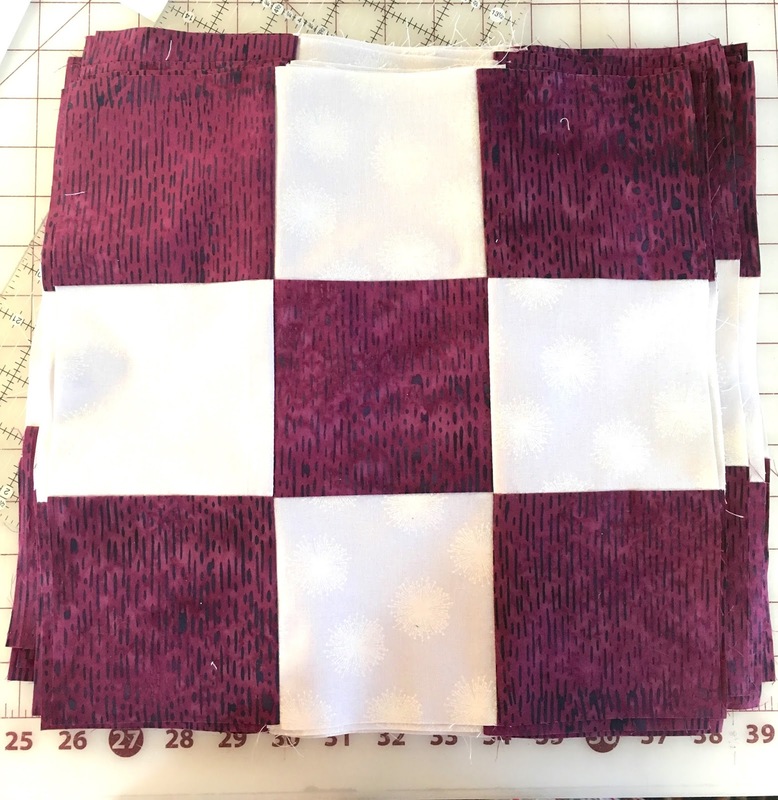 I did a little pre-op at my local quilting shop looking for simple patterns and it was hopeless to find a pattern that I could just make or easily adapt to a 108" square size. It was looking like I was going to be doing the designing. I am typically not a pattern follower so this was ok with me but again with a quilt this big it was getting the calculations correct. I didn't feel that I could just wing it and hope it made it to 108". I needed for her to approve a design and something to work off of so that I could "get it done" and not take extra designing hours trying and figuring things out. At our first meeting she brought along a photo of the wallpaper that was in the room of the recipient. Not that she wanted to match that since it could change at any time but it gave us an idea of what colors the recipient liked and what would go with her current decor. To this first meeting I also brought several patchwork like designs found from the internet and books I had that I thought she might like and also that wouldn't be too time consuming to make. I explained that the less fabrics and simpler the pattern the less time and therefore the less costly. Like I said above I did give her an idea of what it could cost and I knew that no matter what it took I would not charge her above the highest number I gave her, especially since this was my first full sized quilt that I custom made. After this first meeting I felt better knowing a little more of what she was expecting and letting her know what to expect from me. We left this meeting with me trying to nail down a pattern and made a plan to meet again to pick out fabrics. I started doing more research online for patterns and designs. I came across this site Pattern Jam. What an amazing site! You can design your quilt by telling it the size and how many rows you want. It will give you the amounts of all fabric needed. I feel like I just need to clarify that it tells you everything you will need to complete the quilt...like one you designed. I felt like I won the lottery! This took out hours of figuring and frustration. Think about it. If you are planning a quilt you might have a pattern but how do you know how much of each fabric to buy? Our agreement was that we would go shopping together and pick out fabrics and she would purchase it. So I had to know how much to purchase. Too little would mean I had to go back and find and buy more too much and she was overcharged and stuck with extra fabric she didn't need. You can imagine my excitement when I realized this site did all that calculating for me. At our second meeting we met at the fabric shop. It all went surprisingly quickly. We did venture out to one other shop just to make sure there wasn't something out there before we made up our minds. The fabrics we chose were a deep purple batik in a sort of strippey pattern and an off-white on off-white print with a little shimmer. A batik with a non-batik fabric can be a hard match but for some reason these 2 just went together! For the backing she chose a deep black. I designed 4 or 5 quilts on Pattern Jam and presented them to her. She went with a simple Irish Chain. Each block was made up of 4 1/2" squares. I did most of the piecing by cutting the fabric into 4 1/2" strips then sewing those together cutting again in to 4 1/2" segments and then sewing into the 9 patches shown above. The finished block was 12". This planning was probably the most difficult part for me because I had to think about just how many strips were needed of each color to then sub-cut in to what is needed for each block. I really had to push myself to keep it flowing and stay within the quoted hours. I diligently kept my hours on the back of the pattern. I worked on it as much as I could with the hopes of getting it finished in a couple weeks between working and kids. Every time I had an interruption it was accounted for. Sometimes I only got to work on it for 10 or even 5 minutes. Each minute was written down. In the end I tallied the numbers over and over on different days to make sure I wasn't forgetting anything. From start to finish this quilt took me just over 20 hrs. This was from the first cut to the last stitch. I did not account for the meetings we had or the trip to the fabric store or some of the initial planning where I was finding patterns and designing on Pattern Jam. I probably should have added in at least a little time but since this was my first custom quilt I felt like this was a learning experience and a customer should not be responsible for the time that it took me to question myself and what I was doing. In the future I would probably add in a couple hours to account for that planning time if I was the one to get the fabric and design a pattern again. To break the time down a little further. The quilt top took me just over 7 hrs. The actual quilting took me just a little more than 7 hrs as well. The binding took me 5 1/4 hrs. Even though I was trying to save time where ever possible I decided that I wanted to hand-stitch on this binding vs machine sewing it. Because it was being given as a wedding gift and had a special sentimental value I thought this outweighed the time savings. My goal was to make this quilt as soft and cuddly as possible and a machine sewn binding would not have fit into that idea. I also added in 1 hr for labeling it and clean-up. For the cleanup that mostly consisted of going through and snipping threads. I will explain the labeling in more detail later. Now I do want to mention that some major time savers on this quilt was # 1, the fact that there were only 2 fabrics involved. Had there been 3 or 4 or more, figuring out yardage and cutting and block assembly could have easily taken much more time, like hours more. The pattern was another factor. I jammed through cutting 1/2 of the 12" blocks for this quilt because they were a solid fabric block. For the other 9 patch block I simply cut strips and sewed the width of fabric strips together so what looks like it took a long time to sew each 4 1/4" square together was probably more than cut in half by the strip method. And the 3rd major time saver was using a wide back fabric for the backing which saved me lots of time piecing together something to fit the 108" x 108" size. Working with this quilt was a little difficult when it started to become full sized. This was the largest quilt I had ever worked on. All of it, including the quilting stage was done on my Viking Mega Quilter. I'm not sure I could have done it on a smaller machine at least not the quilting part. I don't have a space in my house that is nearly big enough to lay this thing out to prep it for the quilting stage. I may have said in previous posts that my main job is being a property manager for apartments that we own. At the time that I was making this we had a vacant apartment with a huge open living, dining area. It was the perfect space to lay it all out. I don't know what I would have done if I didn't have a vacancy. I got my sweats on and spent a good long time pinning this thing all over. I wish I counted the pins. I even had to use the teeny tiny gold ones that I had lurking in the bottom of my pin box for ages. Here it is shown when I was in the quilting stage. You may be asking why go to all this trouble when I could have brought it into a quilting shop to have it quilted. The main reason was expense. To have someone else quilt it would have been way too expensive. Plus I love the quilting part. I could have rented a longarm machine at my local quilt shop but again even that was going to cost more. Not only would it cost my time to the customer but I would also have to charge her for the time to rent it. The pattern I decided on was a very simple leaf in leaf quilting pattern. I am a big proponent for simple, big patterns. The simpler and bigger the softer and cuddlier! I did a big diagonal (X) going through both ways of the 9 patch. For the borders I did a loopy leaf. I can't find a finished photo of the border but in the photos below of the back you can get a peek of it. For the quilt label I was going to embroider a message from my client. With all old quilts that have been handed down they often become worn to the point of not being read. So I had the idea (and I'm sure I'm not the first) to make a small pocket and tuck the note inside. This will also make it easier to take the note out while washing and preserve the note. Embroidering it would take quite some time and with the pocket it allowed me to hand-write the message. I added a snap just to help keep it in there during use. It was barely visible and I'm sure that if you didn't know it was there you would probably never notice it. This was a very satisfying project for me. It felt good to push myself to complete this quickly. I was happy with the quality and the finished look. After this was delivered to my client it inspired me to finish a couple more quilts that I had in progress for a long time. More on those to come!